.... Prosecution Hits Dead-end As 14 Suspects Questioned Accra, Nov. 22, Gye Nyame Concord -- WHAT WOULD MAKE a nation's security agencies arrest seven people for an alleged subversive plot and only charge one of them for an offence that seems unrelated to the reasons for the arrest? Why did they initiate a process which suggests that they are up to mischief? Was there some credibility to last week's reports of the alleged subversive plot? Did the Police Criminal Investigations Department (CID) not know that issuing a terse statement that suggested the arrest of people for alleged plans to derail the nation's democracy is itself suggestive, in our part of the world, that the said individuals were involved in a coup plot? So why was the statement issued? These were the questions that cropped up in this reporter's mind as he began probing the circumstances surrounding the arrest of alleged suspects for suspected plots to disrupt Ghana's democracy. Today, the Gye Nyame Concord can report, despite the deafening official silence, that former President Rawlings' role in the alleged subversive plots, codenamed “coup plot” by the media, is being investigated. The first hint of the former President's suspected role in the alleged plot was dropped in a newspaper report last Wednesday, which credited the controversial NPP MP for Assin North, Honourable Kennedy Agyepong, as having accused the former President of being a mastermind of the plot to disturb the public peace. The Tema-based Footsprint newspaper quoted the MP as having directly accused Rawlings of being part of a conspiracy to undermine the democratic process during a campaign trail in the metropolis. Hon Agyepong could not be reached by press time to further explain his statement. 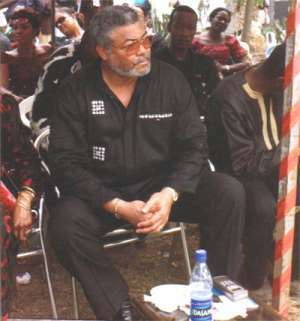 But usually reliable sources within the security agencies also confirmed to this paper that Rawlings' role was indeed being probed and that he may be invited for questioning. The investigators are reported to have learnt that the former President met some members of the suspected 'subversive plotters' on a one-on-one basis. He was clever enough and ensured that he never met them as a group, a source said. “Ame ya mo wo gbemei” (they have arrested our people), he told the crowd in Ga. Details gleaned from usually reliable security sources suggest that the alleged “subversionists”, held meetings during which they allegedly strategised on how to destabilise the nation. Security officials say the venues for the meeting were often not known to all the suspects before hand, since they were often directed to places from where they were picked and relocated to the actual meeting places. Insiders say this made it difficult for those among them who were informing the security agencies to keep track of events to inform them on time. Members of the security agencies were, however, unwilling to make an official statement linking the former President to the alleged subversive plot. “I cannot confirm. We are talking to people and l don't think l need to tell you” said Mr David Asante-Apeatu, Director of the Police CID yesterday (Sunday) morning, when reached on phone. On whether former President Rawlings' name had come up in their investigations, he was non-committal. “I don't know the source of your information, so you may confirm it from the source”, was his terse response. Mr Victor Smith, Special Aide to the former President, in a follow-up phone interview yesterday morning, was equally evasive, though he dismissed the statement by Ken Agyepong and cautioned that “government should think seriously about what they are doing”. “Anyway, they should come. We are waiting for them, they should come” he said, adding that those who were interested in soiling the former President's name, and the likes of Hon Ken Agyepong, “do not know the forces they are up against”. Emerging details of police investigation by press time suggest that the number of suspects interrogated over the alleged plot has jumped from seven to fourteen. Prosecution of the alleged plotters may, however, hit dead-end following differences between state security agencies and the Attorney General's Department over whether to go for an all-out prosecution or save some of the suspects who have collaborated with investigations so far. Sources say a marathon meeting between officials of the security agencies and the Attorney General's office last Sunday saw two positions being pushed. Whilst state security was unwilling to press charges against some of the suspects, whom sources say, acted as double-agents by grassing on their colleagues, the AG's Department insisted that for a successful prosecution, those witnesses ought to be used in court for the prosecution team. The Attorney-General's office was reported to have also advised that with the security agencies unwilling to release details of the alleged subversive plots of the suspects, a successful prosecution may not hold. Sources at the meeting told this paper that the fears of state security, was that exposure of the identities of the other suspects to the public via court could be damaging to the national interest, especially when some of them acted as double agents. “They were planning to commit acts of sabotage and subvert the state. They'd been holding meetings. We've evidence of what they'd been plotting,” Mr David Asante-Apeatu, Director of the Police CID, told Reuters news agency late last week Sunday. Asante-Apeatu said investigators found military body armour and helmets, one firearm and 18 rounds of ammunition but that no serving members of the armed forces were thought to be involved in the alleged plot. “I want to emphasise that what we've uncovered had nothing to do with the armed forces. The group we arrested on Saturday consists of civilians and ex-soldiers,” Asante-Apeatu said. “There were no ex-officers,” he said. So far only one person, Nicholas Owuoba, has been charged. He is on trial for possessing an illegal weapon.